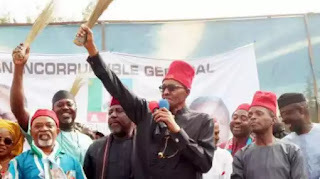 The Buhari Support Organisation (BSO) South East, on Tuesday told Anambra residents not to make a mistake of voting for another party except the All Progressives Congress, APC, in the November guber election. The group said a mistake of electing another candidate, except Tony Nwoye of the APC would be dissastrous to the political interest of Ndigbo. BSO described Nwoye as a broad minded, pro-people politician who had all it takes to win the November 18 governorship polls. In a statement by the Enugu State Chairman of BSO, Chief Anike Nwoga on Tuesday, after the BSO South East Zonal meeting in Enugu, the Pro-Buhari Group called on APC members in the entire zone and indeed, Ndi-Anambra to rally around Hon. Tony Nwoye, as his victory will usher in Ndigbo into the mainstream. “It is our candid view that it is high time Ndigbo returns to the mainstream of Nigerian politics, enough of lamentation and complaints of marginalization from outside the ring. Our ancestors admonished us that when you’re not there, your yam is thrown off the fireside. “In the same vein, we cannot forget the ageless lessons we learnt from the great Zik of Africa. If Zik were to be alive, he will vote for Hon Nwoye who has at the National Assembly cultivated nationwide contacts which we need at this material time for development. Zik will put the collective interest of Ndigbo nationwide ahead of parochial interest,” Chief Anike a Zikist said. BSO South East called on the APC gubernatorial aspirants to rally round Hon Nwoye “for his success is the success of all, as their supporters will be part of Nwoyes’s new government. In the said statement by one Anene Chikezie, the group had claimed that the core APC people in Anambra State were not happy because people who suffered for the party were abandoned, especially the defunct Congress for Progressive Change (CPC) group. “May we make it clear that Timipriye Sylva who won the APC primaries participated fully in the election and was never substituted as claimed by the group. “It is also spurious for the faceless group to accuse the delegates of inducement in voting for Nwoye in the primaries. “The people know that all the aspirants did their best to win the primary at the Professor Dora Akunyili Women Development Centre; the truth is that the delegates conscientiously gave their votes to Nwoye, knowing that he clad the peoples interest at heart and possesses the brain and the brawn to win the governorship polls on November 18. His antecedents are there to speak for him. “The valid questions are: did Hon Tony Nwoye induce the Anambra East and West electorates to win the House of Representatives in 2011 under Governor Obiano’s watch? Did he induce the electorate to win the House of Representatives in 2011 under Governor Obiano’s watch? Did he induce the electorate to win the House of Representatives again in 2015? Did he induce the Anambra State electorate to emerge as 1st runners up in the 2013 governorship election, even when litigations fatigue of his former party, the Peoples Democratic Party (PDP) did not allow him to follow through his case. In sum, it is obvious that the delegates chose Nwoye because he represents a generational change in leadership, is pro-people and has the requisite experience to win the election”, BSO said. On the reference made to Nwoye as a stranger in APC, BSO recalled that APC held an emergency national convention shortly before the 2015 general elections where the party resolved that defectors were entitled to the same privileges with old members. “We know why they are afraid of Hon Nwoye and we sincerely expect more tantrums and heavy dosage of propaganda in the days ahead, for let’s not forget that the federal constituency Hon Nwoye represents is His Excellency Governor Willy Obiano’s federal constituency. “That he won under incumbent Obiano’s watch is the gross anxiety being displayed and the signpost of what to expect in 18 November, 2017 gubernatorial election,” Chief Anike submitted.